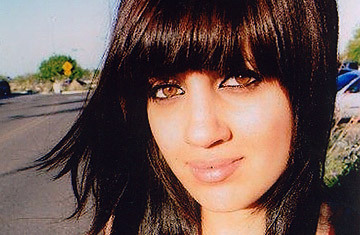 "Dude, my dad is here at the welfare office," a 20-year-old woman named Noor al-Maleki texted a friend on Oct. 20, 2009. Noor was at the Department of Economic Security (DES) in Peoria, Ariz., helping Amal Khalaf fill out paperwork for food stamps. Noor was living with Khalaf, a maternal figure whom she'd known since childhood. Noor was estranged from her parents, who disapproved of what they considered her American ways  a fondness for tight jeans and makeup, and a reluctance to accede to their plans for her. Those plans included an arranged marriage to a man in Iraq. Her father, Faleh al-Maleki, was furious when Noor abandoned the marriage, later becoming involved with one of Khalaf's sons. A few weeks before he turned up at the DES office, according to Khalaf, the father warned her that if Noor continued living with her family, "something bad would happen." He meant it. Faleh, who had become a U.S. citizen two months earlier, told his son that he went to the DES to apply for benefits; he had lost his job. But after apparently seeing the two women there, he stalked out. Khalaf went outside to talk to him but couldn't find him. It was a sunny day, in the mid-80s, so Noor suggested going to a Mexican restaurant across the parking lot for a drink. Walking slightly ahead of Noor, Khalaf glanced to her side and saw a gray jeep bearing down on them. Faleh was in the driver's seat. Khalaf saw him turn the wheel sharply and head toward her and Noor. She made eye contact with him, throwing her hands in the air and yelling, "Stop!" Faleh kept going, plowing into the women and speeding off. Khalaf never felt the impact. She awoke on the ground to strangers huddled over her. Khalaf couldn't see Noor, gasping for breath as blood gushed out of her mouth. The jeep had rolled over her. She suffered a head injury and multiple facial fractures, among other injuries. She never regained consciousness. On Feb. 22, Faleh al-Maleki was convicted of killing his daughter, committing aggravated assault against Khalaf and leaving the scene of a crime. His defense attorney argued that he had intended to spit on Khalaf and accidentally ran over the two women. Prosecutors had pressed a first-degree murder charge. They characterized his actions as an "honor killing," a controversial term that refers to a family member or members killing a relative, usually a girl or young woman, whose behavior is judged to have tarnished the family honor. "Some families think that the women of the family represent their reputation," Rana Husseini, a Jordanian journalist who has spent nearly two decades campaigning against the practice and author of the book Murder in the Name of Honor, explains. "If a woman has committed a violation in their point of view, they believe if they kill her, they have ended the shame. Blood cleanses honor." According to the most recent U.N. Population Fund estimate, which is more than a decade old, 5,000 such killings occur worldwide each year. Experts believe the real number is actually much higher. The jury found Faleh guilty of the lesser charge of second-degree murder, finding that he didn't plan the act in advance. They also found the existence of aggravating factors, which means he could face up to nearly 46 years in prison. The evidence presented at trial made clear, however, that Faleh was influenced by a warped sense that Noor had impugned his family's honor. Most honor crimes take place in villages in the developing world, however, not in the parking lot of a nondescript American welfare office. The U.S. is supposed to be the melting pot, where immigrants assimilate into the larger culture, discarding much of their native selves. But some communities  like Faleh's  have stubbornly resisted that transformation. Noor's murder was an anomaly, but the attitudes that facilitated it don't spring from the brain of a single deranged man  they are deeply rooted in an Iraqi community that insists on its right, its American right, to believe in the justifiability of practices like honor killings. The exact origins of honor killings are not known; the practice likely existed among different ancient cultures. Among northern Arabian tribes, the practice predates Islam in the 7th century. In a typical honor killing, the victim is judged to have engaged in a transgression that can encompass just about anything  from wearing Westernized dress to becoming a target of gossip to balking at an arranged marriage to being raped. The murder is often a collective family decision, with the father, a brother or male cousin carrying out the act; rarely, a female relative like the mother does the killing. The crimes occur most commonly in the Middle East, South Asia and North Africa. Without decent statistics, it's impossible to ascertain which countries are the worst offenders, but Husseini points to Pakistan, Yemen and Iraq. In those countries and elsewhere, honor killers are treated with lenience; they often get a slap on the wrist if they plead honor as a mitigating circumstance. It used to be that an honor killer in Jordan could plead a "fit of fury" defense  similar to the crime-of-passion defense in Western penal codes  and do little or no time at all. In 2009, Jordan toughened the application of its laws, making it harder for honor killers to invoke the fit-of-fury defense. To elude even the light penalties that often exist for honor killings, however, families sometimes delegate the bloody task to male juveniles. Islam doesn't sanction honor killings, and the practice is not limited to Muslims. The crimes also occur in Christian communities in the Middle East and in non-Muslim communities in India. Last July, for example, after a number of Hindu girls were killed for dating out of caste, the Indian Prime Minister convened a commission to investigate whether harsher laws are needed to curb the crimes. The majority of crimes, however, do occur in Muslim communities, and some of the perpetrators seem to believe that killing for honor is their religious duty. Strict attitudes toward sexual behavior in Islam  sexual relations outside marriage are punishable by death in Saudi Arabia and Iran  don't discourage that mind-set. See "The Myth of Homegrown Islamic Terrorism."